Loft Bed free building plan. 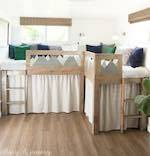 L Shaped Kid Beds with Storage plan. Build an awesome loft bed with a sliding barn door using the free woodworking plans available at the link. Princess Loft Bed free plan. Build this princess loft bed using these free step-by-step woodworking plans. Any princess would love to sleep in this piece. This loft bed is designed to open up floor space usually consumed by a bed. It also provides a location underneath it for a kid or kids to play, do activities or set up a desk. Cabin Loft Bed free building plan. Build this fun twin size cabin loft bed using these free woodworking step-by-step instructions. children will want to go to bed if they have one of these. Loft Bed with Desk free building plan. This loft bed makes great use of the space below by incorporating a desk and lots of storage. Here are the free plans to build it. This is a link to a Google 3D SketchUp drawing for a little girls loft bed shaped like a doll house. You will need the SketchUp software to download this drawing and its freely available online.